I was experiencing the same problem and got it fixed following below steps. Though you get the error "exportArchive: requires a provisioning profile", successfully creates Archive but fails to create IPA. Assuming the issue is faced creating Distribution IPA, Xcode 9 has introduced continuous integration for Distribution IPA's which is great. As part of that, Xcode Bot CI requires ExportOptions.plist for generating Distribution IPA's. 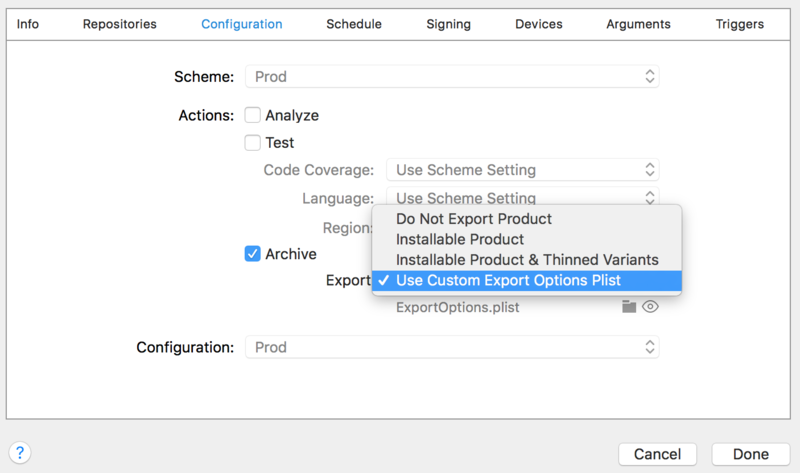 One way to get ExportOptions.plist file (Refer the below link for direct Apple's steps), Try manually creating a Distribution IPA once, with valid Distribution certificates and Profiles which will create an IPA with "ExportOptions.plist" file along with IPA. from Export Options dropdown (Refer attached screen shot) and refer to the created "ExportOptions.plist" file. Now Integrating will create both Archive and IPA with no error. Not the answer you're looking for? Browse other questions tagged ios iphone xcode-server or ask your own question.